Varg - Nordic Flora Series Pt. 3: Gore-Tex City. Vinyl LP. Bleep. Varg reaches number 3 within his explorative Nordic Flora series with what we would deem the year's greatest techno album bar none; Gore-Tex City. While it is undoubtfully a techno record at its core, what makes Nordic Flora Series Pt. 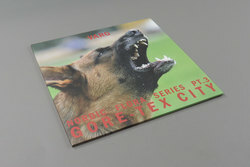 3: Gore-Tex City such a captivating listen from start to finish is the variations of sound and style that Varg seemingly with the slightest of ease and effort makes entirely his own. The album is split into two parts, floor focused techno and a delicate, yet fairly hard hitting pop/rap melding crossover. The first half splits between the Northern Electronics' signature haunted, almost gothic ambience. This seeps through strongest on the rattled bones of album opener Champagne Ceremonies, its bittersweet funeral march calling to mind the recent acquisitions of Regis and Blackest Ever Black. While Platforms Surrounded by Fences (EU) takes the blueprint industrial minimalism of Sandwell District and fractures it with an icy, Nordic glaze that sees it reaching depths other producers can't even begin to circle. The true brilliance to Varg's sound though lies within the album's second half. His ability to throw us with tracks like Forever 21 / Valium featuring Chloe Wise's poetry that both mystifies, confuses and strangely entices in equal measure, create moments of reflection in-between the knife-edged beats. This theme is no more evident than on Red Line (114 Östermalmstorg - 127 Vårberg) where Varg blends a heart-wrenching piano across a splattered rainfall drum pattern. Strikingly it sounding quite like the second yet never reached chapter of Coil's Ether, minus of course, the vocal of John Balance returning downstairs his mind still turned off. The Coil influence bleeds through strongest on the blistering drone of Fonus, produced with Alessandro Cortini and ex-Coil member Drew McDowall. 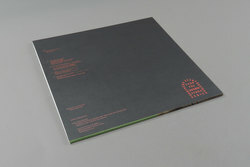 A sure to be considered true modern classic of drone electronics. 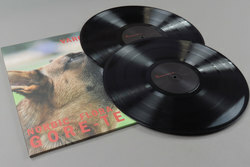 Within the space of only three releases, the Nordic Flora Series is rewriting any rulebook for what techno is. From dazzling pop-centric trax like Blue Line (112 Rådhuset) produced with the seductive digitized vocals of AnnaMelina to the best example of (and possibly first?) techno x rap cross border as found on Red Line II (127 Sätra C) 4 produced with Yung Lean spitting bars. No matter what you are into we urge checking out this series, Varg is truly crafting out some of the most crucial and exciting electronics in any scene, anywhere in the world right now.